Flank steak is delicious when it’s marinated in Cuban flavors and grilled, and this tasty flank steak is low-carb, Keto, low-glycemic, gluten-free, South Beach Diet friendly, and can easily be Paleo or Whole 30 with the right ingredients. Use the Diet-Type Index to find more recipes like this one. Click here to PIN Grilled Cuban Flank Steak! In one of my previous lives, before I became a food blogger and a carb-conscious eater, I used to be president of my local teacher’s association, aka the teacher’s union. This was a demanding high-pressure job that I sometimes loved, sometimes hated, but one thing I did enjoy about the job was the chance to travel. I went all over the U.S., and it was in Miami Beach that I had my first experience with Cuban food. I loved the way beef and pork were marinated in lime juice in the Cuban cuisine, so a few years ago I tried to re-create that flavor in this flank steak. Grilled Cuban Flank Steak is one of my most-used ways to cook beef on the grill. If you’re grilling for a beef-loving Dad this weekend, I can promise this will be a hit! You can’t read the price, but this lean flank steak I got at my local market was a bargain. If you’re making this for the South Beach Diet, remember the guideline to choose meat with less than 10% fat. 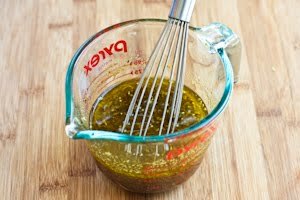 Combine the fresh lime juice, olive oil, cumin, oregano, onion powder, garlic powder, soy sauce, Chipotle chile pepper (or hot sauce), and lime zest (if using.) Whisk together. When meat is done, let it rest for 5-minutes before you slice it. For a low-carb meal this would taste great with Bacon, Tomato, and Zucchini Salad with Feta or Grilled Zucchini Greek Salad. Flank steak is delicious when it’s marinated in Cuban flavors and grilled! Take meat out of refrigerator and let it come to room temperature before grilling. Grill meat to desired doneness, approximately 4-5 minutes per side for rare to medium rare or 6 minutes for medium. I wouldn’t cook flank steak more than medium or it will be tough. 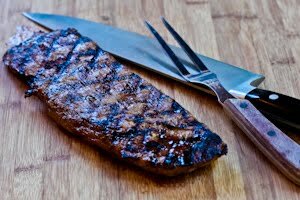 Cooking time will depend on the thickness of your flank steak, the best way to judge the doneness is to use an instant-read meat thermometer, cooking to 140-145 for medium rare or 155-160 for medium. (The meat in the photo was cooked about 5 minutes per side. Slice across the grain and serve hot, with slices of fresh lime to squeeze on the meat. Grilled Cuban Flank Steak is a perfect main dish for any type of low-glycemic or low-carb eating plan or any phase of the South Beach Diet. I love Cuban flavors and like to marinate beef, shrimp and even fish in the lime and cumin. 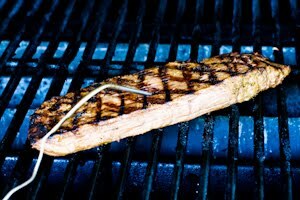 Flank steak on the grill really is the best! 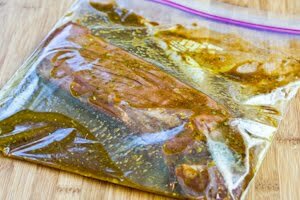 It wouldn't hurt to marinate flat iron steak in this marinade for a few hours, but flat iron doesn't really need to be marinated; it's much more tender than flank steak. 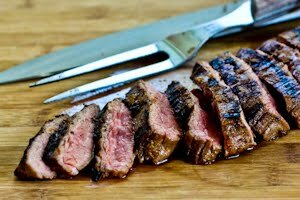 Here is my favorite recipe for Flat Iron Steak. 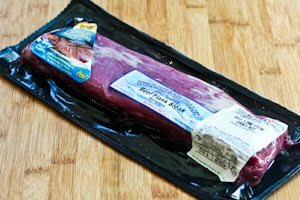 Would this work well for a FLAT IRON Steak?? OMG Kalyn, that looks DELICIOUS! We do a lot of grilled meats and I'm always looking for interesting new marinades. This one fits the bill!